While your greenhouse is still cool, plant micro-greens. You can pick and choose which ones you like and grow them all together in any combination. If you keep the seeds in your freezer or refrigerator they will last for 4-5 years so you can purchase them in bulk. I have a couple of dozen seeds in my freezer all the time. When I’m ready, I pull out what I need, soak them if required (most are not), and plant. Within a few days I have a microgreen salad ready to go! Chia has become a popular seed to add to a micro-green mix. It is of the mint family and was originally cultivated by the Aztecs. The seeds transform into green shoots ready for eating in 5-6 days and are said to be filled with vitamins (A, B, C and E) and minerals (Calcium, Iron, Magnesium, Niacin, Phosophorus, and Potassium) They are 20-25% protein and loaded with antioxidants. Buy a ChiaPet if you must, but they do even better ON, not in, a hemp bag. Just lay the hemp bag on a plate, get it wet,and sprinkle seeds on the surface. It’s so easy that it’s a great beginning planting experience for your kids – without the pet. Arugula is another favorite. Mildly spicy, Arugula is from the same family as broccoli, cabbage and radish. It sprouts in about the same time as chia and can be grown on the same hemp bag. 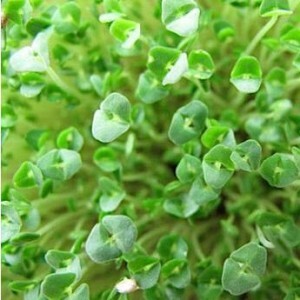 Curly Cress is another favorite. Similar to Arugula in its flavor it is from the same family. Toss a few of these seeds on your hemp bag as well. Of all these seeds, some are mucilagineous and same are not. Mucilagineous means they store water around themselves. They are difficult to grow in a normal sprouter, but since some of the micro-greens are mucilagineous and some are not, they can be mixed together and easily grown on your hemp bag. If you want more details on the individual seeds and the best place to purchase them, check out sproutpeople.org. Gil has been a diehard sprout guy since the early 90’s when his wife Lori sort of pushed him into it. They are the most knowledgeable people out there and they are the reason my freezer is full of seeds. I don’t make any money from this recommendation, I just believe in them! If you haven’t tried sprouting yet, you must. Not only is it quick, I truly believe there is more nutrition in sprouts than almost anything else you can eat. Previous post: Early Blossoms on Greenhouse Seedlings – Disaster! Next post: Greenhouse Carrots – Which Ones to Choose?